After a taking a moment to gather ourselves we jumped back into the swing of things and took to it like a peking duck to water. 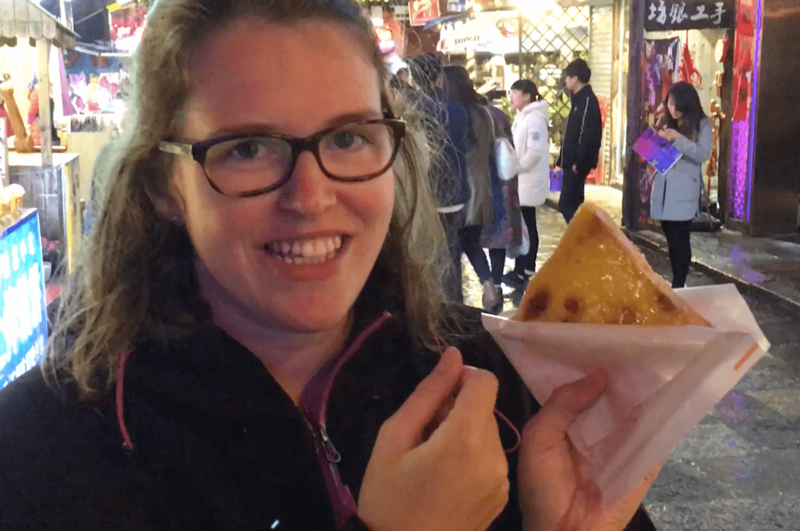 First stop was Zhuang’s “Pie” stall. This caught our attention because of the quick handed craftsmanship that goes into creating the initial patty. A small ball of dough is rolled out and what looks like far too much filling is piled on to it’s centre. 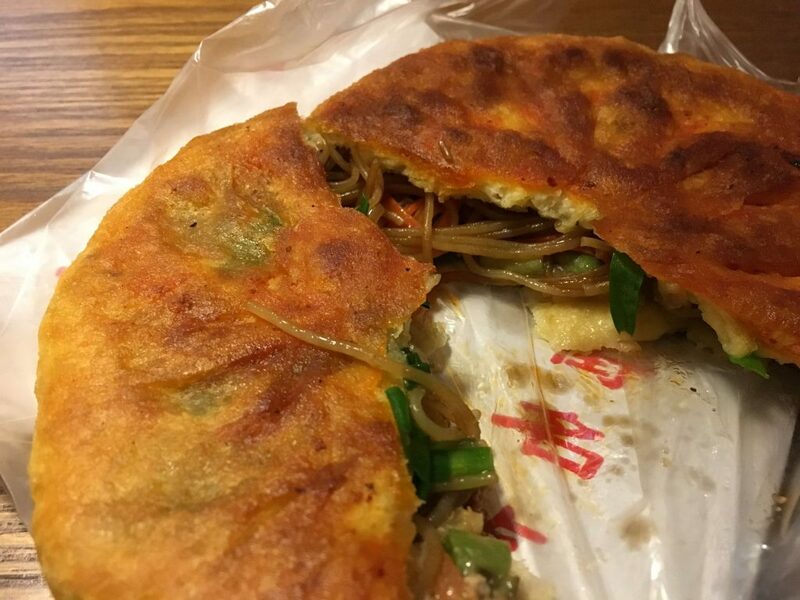 The street food vendor then skillfully pulls the sides of the dough up and over the filling, completely sealing it into a chubby dumpling. This is then gently rolled into a disc about the size of an American pancake, about 1.5 cms thick, and shallow fried in a big wok. As you can see below it’s a full meal in a conveniently edible parcel which is why I’m calling it a Chinese Pasty. Next up Manuel spotted giant octopus tentacles on a stick – which I’m calling Octo-pops – and immediately ordered one. 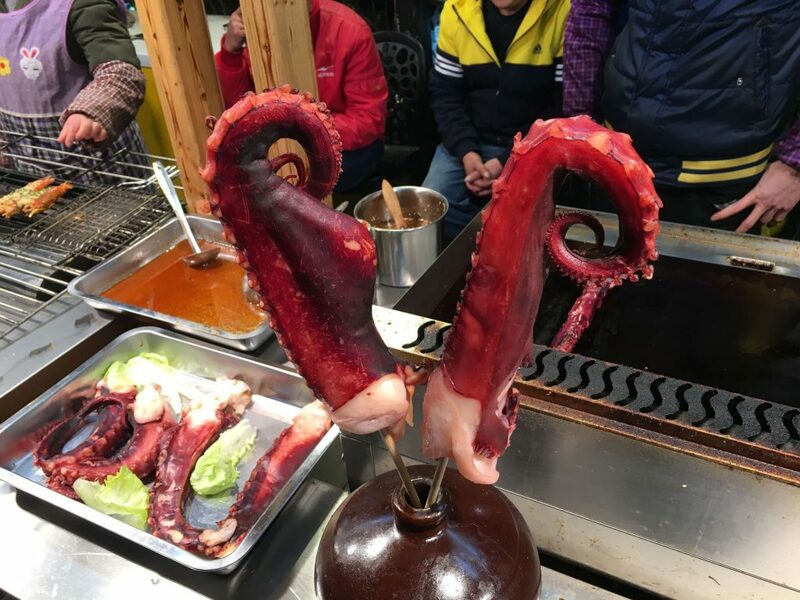 He was a little disappointed when they removed the skewer and diced the tentacle into little bite sized pieces. He was further perturbed by the amount of sauces, glazes and seasoning, that went onto the barbecued dish, disguising any suggestion that this was in fact seafood and not chicken. He offered me some to taste (who am I kidding, I tucked right in without asking) and whilst I agreed it didn’t taste like squid, it was still pretty tasty. Savory stomach satisfied, we needed to address our sweet tooth (teeth? tooths?) but struggled to find anything particularly tempting. Whilst plenty of the all-too-similar shops along West Street sell overly strong ginger candy, sesame based crunchy stuff or mysterious marzipan like paste, it wasn’t what we were after. My mind had set itself on freshly made doughnuts (they were deep frying so many other kinds of dough, and Manuel was craving ice cream. He’s Italian, he always wants ice cream. I found a bread-and butter-pudding looking stall advertising Irish Rock Burn Cream (make of that what you will) and ordered a slice. It was weird. Kind of nice but the sort of comfort food you might make for yourself when the kitchen cupboard is getting low. Cheap sliced white bread, some egg maybe, cream possibly… worth a try but not mind blowing. 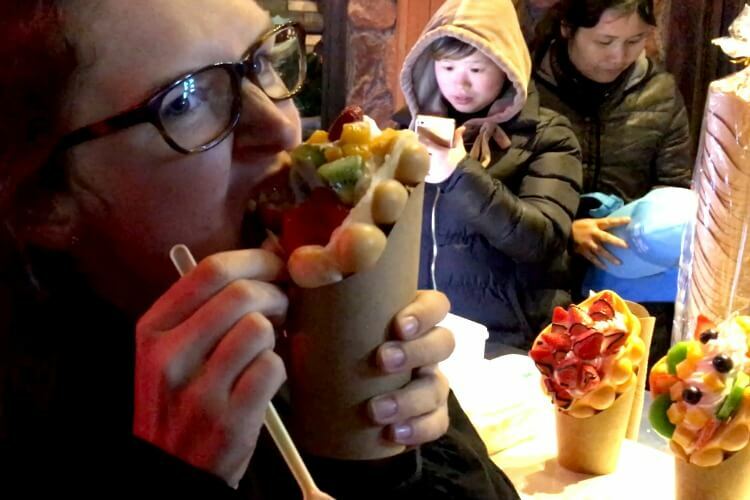 We we’re nearly home and it was getting quite late by now, so in a last ditch attempt we turned off West Street and straight away found ourselves in front of a Bubble Waffle and Ice Cream stall. Manuel ordered an ice cream but I couldn’t resist going all out; bubble waffle stuffed with ice cream, strawberries, mango and kiwi. Just think of the healthy vitamins I was getting! Watching it being made I soon realised that this dessert was going to be the size of my face and that perhaps my eyes had been bigger than my stomach. Ah well in for a penny in for a pound (or two). We retired to bed that night totally stuffed and very happy with our little foody adventure.